I sooo wish that this would have gotten the 'The Social Network' treatment. I wholeheartedly believe that even with someone like Kutchner, Fincher would have made a masterpiece out of it. Casting-wise, I wasn't too upset about Kutchner's selection. Having grown with him in that 70s show, he felt like he belonged among all the bearded, long-haired misfit computer geeks from Apple's beginnings. 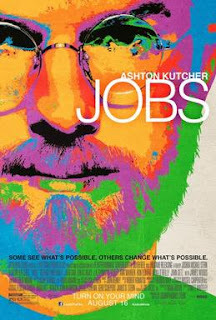 Without Fincher's edge, however, this seems more like a 2 hour, lawyer and marketing-team-approved commercial for Steve Jobs (not necessarily for apple). It claims not to shy away from his negative aspects (showing how he withheld shares from some of the people who were there from the beginning and cutting ties with his daughter), but overall it glosses over that with a story that it wants to portray as one of a visionary taking back what was his to begin with. It is as if it tries to hit all the keypoints in the apple/Jobs history, while not devoting enough to the 'soul' of it all, but rather trying to create a well-balanced, accessible, digestible story that is superficial under the guise of being genuine. I suppose, much like Jobs' philosophy, it projects an image of an ideal, hitting all the key cues for making us believe that ideal, but is, in the end, a simple product - average, but overhyped.